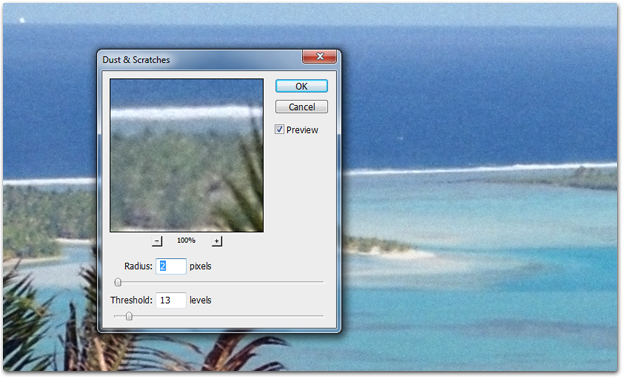 If you use the tips you're about to learn, you will get smoother looking negative scans, without grain. And you're going to learn something about "noise". 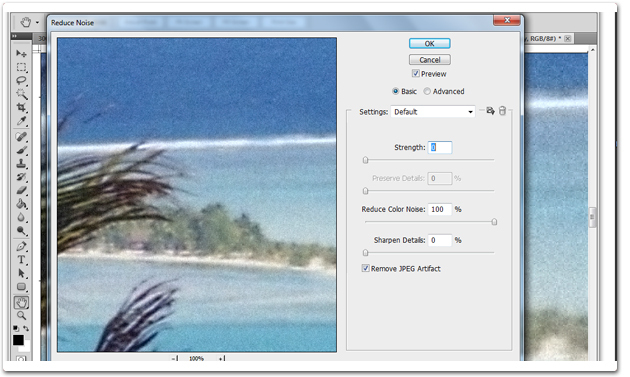 If you remove too much grain (noise), you'll also take away a lot of picture detail. Do this right now... take out an old negative strip, and take a closer look. You'll notice an "ISO" number. Maybe your ISO number is 200, 800, 1200? The higher the ISO number, the grainier your negative scan will be. But hold on! This grain is important because its what gives you detail, sharpness, and depth. That's why negative film with a higher ISO number was more expensive. 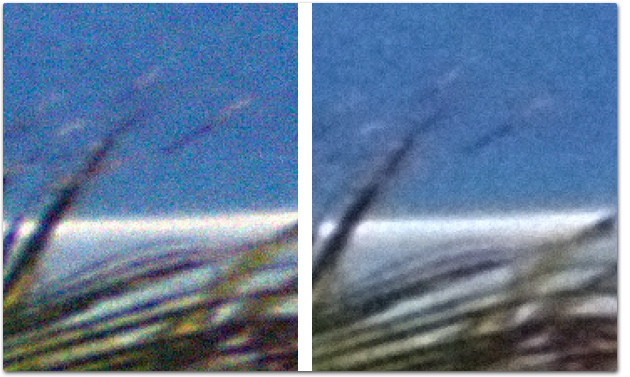 Here's an example of a photo taken with ISO 200 film vs. one taken with ISO 1200. 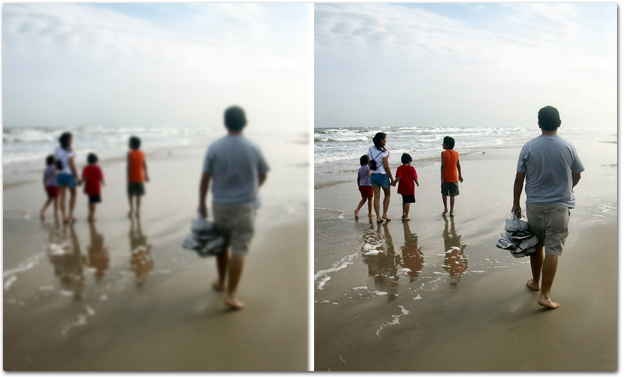 Higher ISO film means that it can take in MORE light. And more light coming in through your camera and onto the film means you'll get a sharper, more well defined picture. But here's the problem -- scanning is different than printing. This noise is needed when printing. But when scanning, it means your digital images will also be grainy. So how do you get rid of grain from a negative scan? And how do you get rid of it WITHOUT messing up any detail? 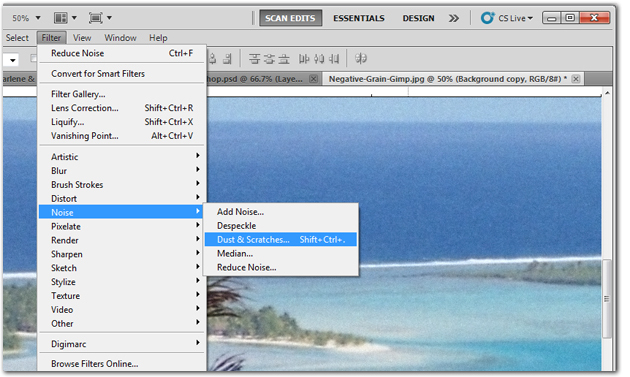 You can use your scanner's software to remove negative grain. 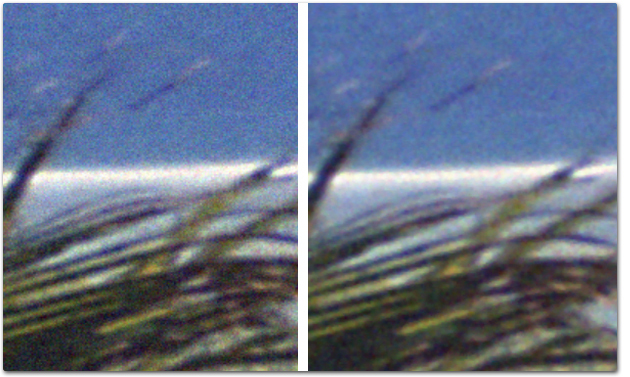 When you fire up your scanner, look for something like, "Grain Reduction". And some scanner's will give an option of how much grain you'd like removed. 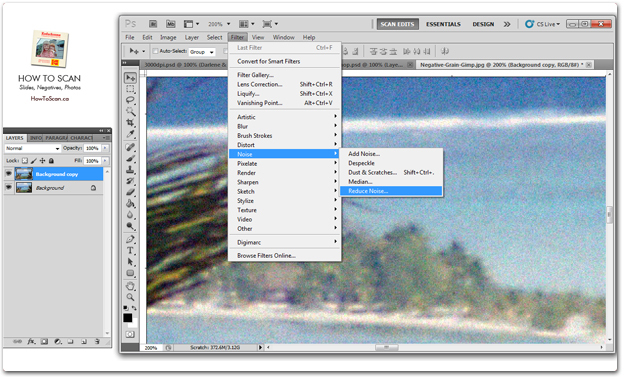 Your scanner's software will have an option to remove Grain. 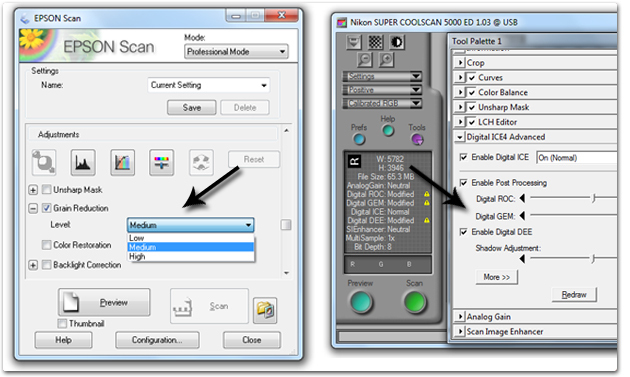 My Epson V500 calls it Grain Reduction, and my Nikon Coolscan calls it Digital GEM. Big problem, though. Your scanner is great at scanning. But it's not so great at editing digital images. And since every negative is different, you can't apply the same Grain Reduction setting to ALL your scans. Every scan is different. Increase the Alpha and Radius. In my case I've increased it close to 1.00. But your negative scan may be different. 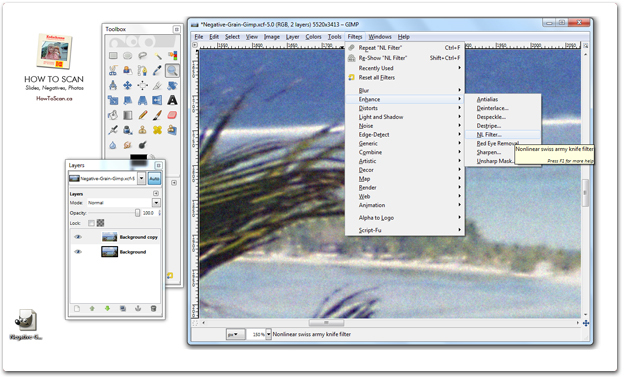 So increase those two values and use the Preview to check back and forth. What you don't is your image too look too smooth, or like a painting. Drop all the values -- except for Reduce Color Noise. What this will do is remove all the little red, blue, green dots you don't need. Keep the Radius down pretty low, and adjust the Threshold. Don't increase the Radius too far because then your pixels will be too smooth, and your image will look like a painting. Which of these scanning troubles do you want to overcome? 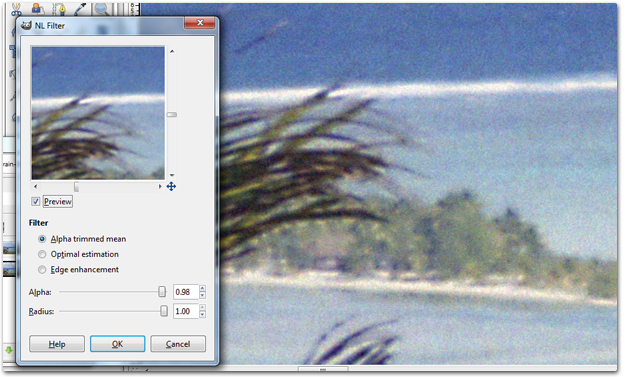 How to setup your scanner to get higher quality digital images -- 24bit JPEG? 48bit TIFF? Understand the technical stuff of a digital image so you can make sideshow videos, reprints, and more! Hey, my name is Konrad. 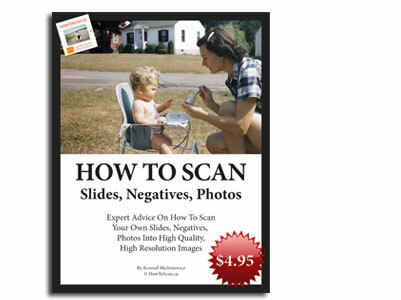 I've been scanning professionally since 2005. I've helped multi-billion dollar companies, pro sports teams, pro photographers, artists, museums, book publishers, etc. I've scanned over 930,000 slides, negatives, photos. The reason I'm telling you this is because no matter what challenge or frustration you're having, I know exactly what you're going through. So, to help you RIGHT NOW, I've put together a super simple scanning guide to get you started.